This edition of the of the Asia-Europe Economic Forum is entitled: “Riding the new waves: Asian and European Economic Perspectives” and will be held in Beijing on 21-22 September 2016. The 13th Asia-Europe Economic Forum was held in Beijing on 21-22 September 2016. The event titled Riding the new waves: Asian and European Economic Perspectives was organised by this year’s host, the Chongyang Institute of Finance, Renmin University of China (RDCY), together with Asian Development Bank Institute (ADBI) and Korea University (CEAS) on the Asian side, and Bertelsmann Stiftung, Bruegel and Centre d’Etudes Prospectives et d’Informations Internationales (CEPII) on the European side, with the financial support of the Asia-Europe Foundation. Amid the Asia-Europe Economic Forum on the fringes of the 12th ASEM Summit, Bruegel senior fellow hosts a conversation on developing global trade relations, with guests Moonsung Kang, professor as Korea University, and Michael G. Plummer, director at SAIS Europe – Johns Hopkins University, for an episode of the Bruegel Backstage series on ‘The Sound of Economics’. The 14th Asia Europe Economic Forum will be held in Seoul on 20-21 September 2017. Bruegel co-organised the 12th Asia Europe Economic Forum (AEEF), which took place on 1-2 October 2015 in Paris, France. This year's conference is entitled "Global Governance of Public Goods: Asian and European Perspectives". The 11th AEEF Conference discussed the topic "What can Asia learn from economic reforms in Europe?". 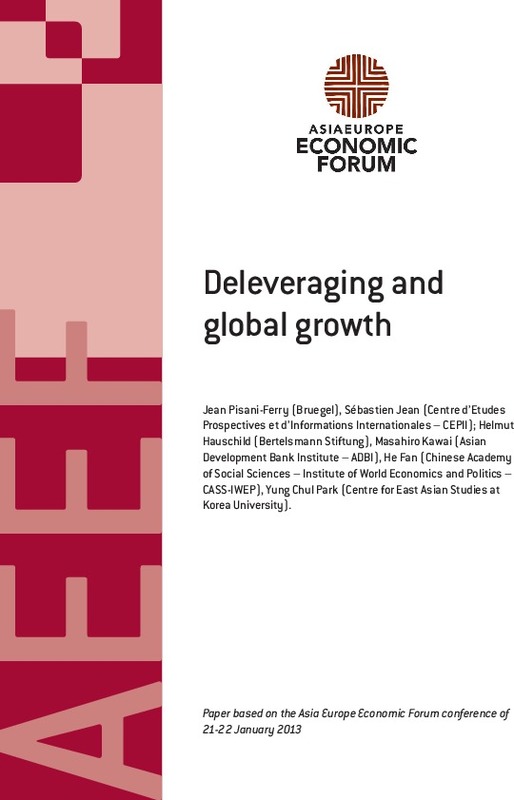 Paper based on the Asia Europe Economic Forum conference of 21-22 January 2013.